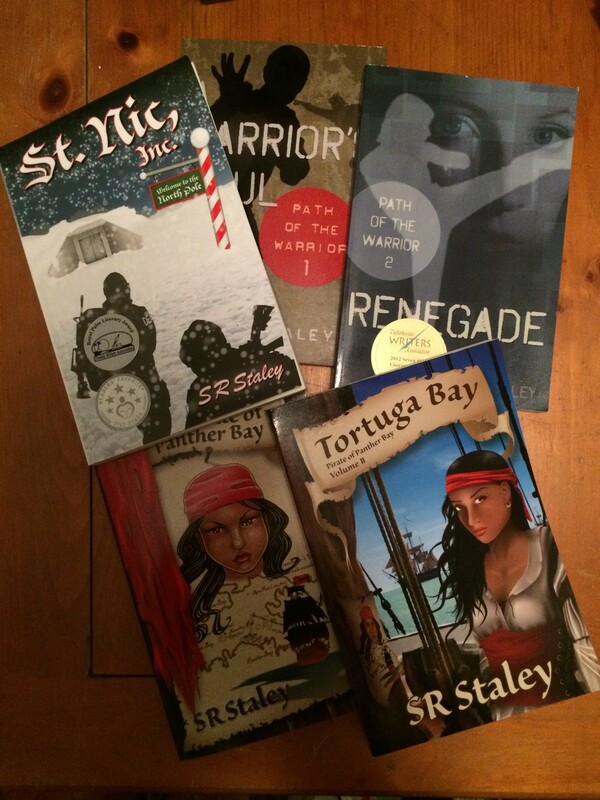 Isabella and Tortuga Bay take home three awards at RPLA 2016! Tortuga Bay takes home three awards in 2016 Royal Palm Literary Award competition. Isabella, Jean-Michel, and Juan Carlos did well in Orlando at the Royal Palm Literary Awards dinner. 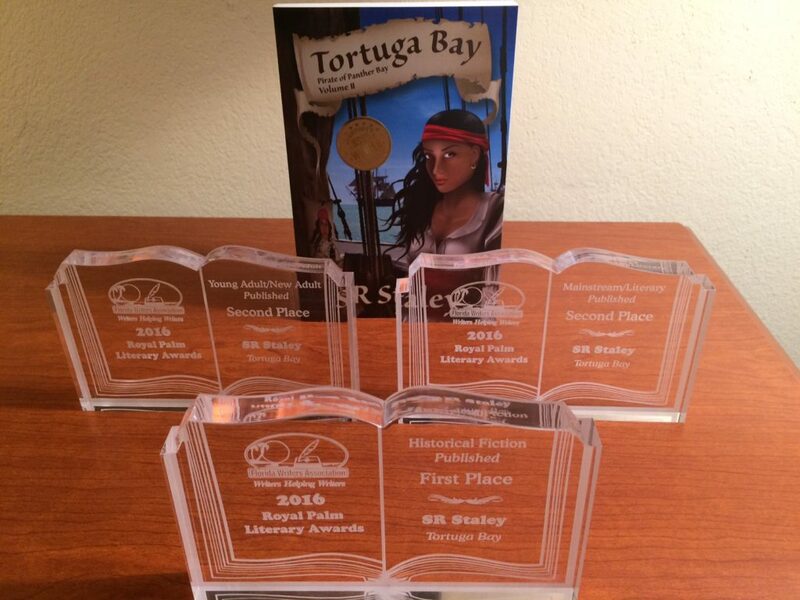 Tortuga Bay took home three awards, including first place for Published Historical Fiction, second place for Published Mainstream/Literary fiction, and second place in Published Young Adult/New Adult categories. The novel made the finals in Published Women’s Fiction, but didn’t place among the top three books. The Tallahassee Democrat covered the wins in the newspaper (see here), and a complete list of winners can be found on the Florida Writers Association website here. 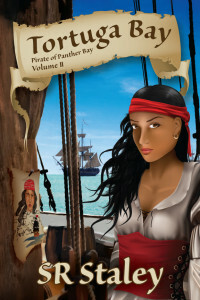 This competition confirmed something that I thought was true after listening to readers: the Pirate of Panther Bay series has cross genre appeal. Adults and teens enjoy the series and the characters. I am really looking forward to seeing the third book out (in late 2017 if the stars align). Combined with the two first place/gold medals earned in the Florida Authors and Publishers Association competition, and reaching the finals in the Eric Hoffer Book Awards, this has been a stellar year for me and the series. This entry was posted in Awards, Awards, Marketing, SR Staley, Tortuga Bay and tagged florida writers association, Isabella, Royal Palm Literary Awards, RPLA, SR Staley, Tortuga Bay on October 30, 2016 by SR Staley. Tortuga Bay Finalist in Eric Hoffer Book Awards! Tortuga Bay, the second book in the Pirate of Panther Bay series published by Southern Yellow Pine Publishing, is a category finalist in the 2016 Eric Hoffer Book Awards! While Isabella didn’t win her genre categories (in this case Young Adult or General Fiction), the accomplishment is very significant. The award notes that less than 10% of nominees become finalists. I estimate that at least 1,270 titles were entered into the competition. So, this is still an impressive showing for her and her crew. I am particular excited about this performance in a national book competition for professional and personal reasons. First, the Hoffer Awards are an international competition that has become one of the largest book award programs in the nation, focusing on small and independent presses as well as self-published authors. Second, on a personal note, Eric Hoffer was one of my late father’s favorite authors and philosophers. Eric Hoffer was a mid-20th century writer and philosopher, often referred to as “The Longshoreman Philosopher,” because he wrote most of his books and other writings while working the San Francisco docks as a longshoreman from the late 1940s until 1967. He wrote several books, but his most widely read one is The True Believer: Thoughts on the Nature of Mass Movements (a book that I think is highly relevant even today). I own several copies, including my father’s marked-up copy. The Hoffer Book Award was founded “to honor freethinking writers and independent book publishers of exceptional merit.” Indeed, Isabella is free thinking and Tortuga Bay grapples with some of life and society’s most pressing issues of freedom. This is quite appropriate coming from an influential social philosopher with no academic background who wrote his first books (a novel) and articles while living on Los Angeles’s skid row. These experiences gave him “a respect for America’s underclass” according to the wikepedia entry on his life, quoting him as saying it was “lumpy with talent.” He was awarded the Presidential Medal of Freedom by President Ronald Reagan in 1983. This entry was posted in Awards, Awards, Marketing, SR Staley, Tortuga Bay and tagged book awards, book reviews, Hoffer Award, Isabella, Tortuga Bay on May 19, 2016 by SR Staley. Where do good female characters come from? The observation that caught my attention was that she had started writing Four’s (Tobias Eaton’s) story, not Tris’s. But it was boring so she stopped, and didn’t get back to it until four years later! Her experience is strikingly similar to mine when I was crafting The Pirate of Panther Bay back in 2000. At the time, I was writing a young-adult romance about pirates because I thought it would be exciting and different. The protogonist started out as a male. But after about 50 pages (I got further than Ms. Roth), I put the manuscript down because it was boring! My story was just another pirate trolling through the Caribbean for loot. Ugh. I am not sure how Ms. Roth “found” Beatrice, but Isabella’s “birth” was actually quite analytical. Since I was writing fiction, and story turns on conflict, I asked myself what would happen if I made the pirate captain female? The story became much more interesting, because virtually any plot putting a woman at the center in a leadership position in the 1780s was going to create conflict and tension. This was particularly true on pirate ships where crews were superstitious and almost always banned women on their vessels. For Isabella to get on the boat in the first place, she would have to overcome significant hurdles. She would also have to be strong–she couldn’t be a stowaway or consort, or start out in a typical role. The path to the captaincy of a pirate ship simply couldn’t take that route. More importantly, the conflicts created a fascinating story line that allowed me to really flesh out Isabella’s character as well as the major male protagonists. Each of the major characters had a dramatic arc and singular journey that would feed of each other. The results have been great, particularly in the most recent installment, Tortuga Bay. 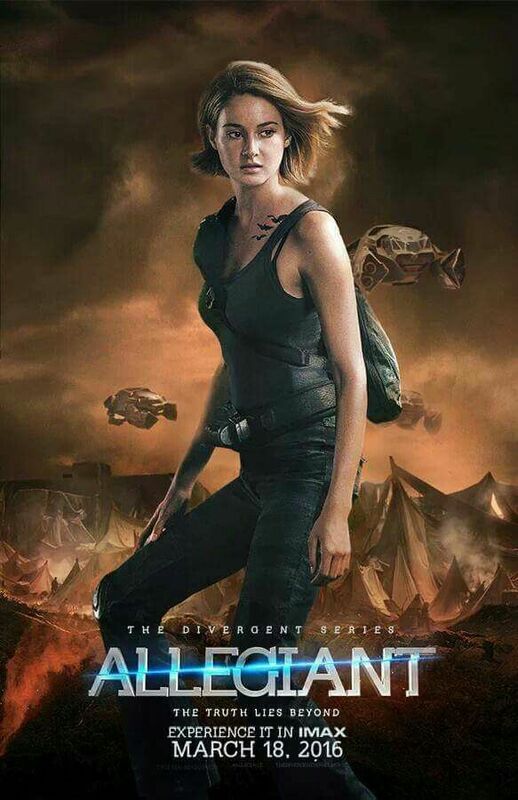 I hope Veronica Roth talks more about the literary beginnings of Beatrice Prior. I found her character to be very similar to Isabella in terms of personality and temperament. Now, if I can just get The Pirate of Panther Bay made into a major motion picture…. This entry was posted in Characters development, Keys to Success, Pirate of Panther Bay, SR Staley, Teen & YA fiction, writing and storytelling and tagged character arc, character development, divergent, Isabella, pirate of panther bay, storytelling, Tris Prior, Veronica Roth on March 29, 2016 by SR Staley. 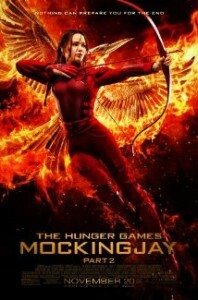 Is Katniss Everdeen a strong female character? Strong characters should have strong identities. Identities evolve, and characters don’t need to start out strong, but they need to end strong. They have to develop a sense of their own place in the world and how they relate to it. Moreover, this identity has to be recognized by their peers. Strong characters should relate to peers as a peer. Self-doubt, even self-loathing, can be powerful tools for the novelist, and often provides tension that propels story. But at some point strong characters need to break out of their narcissism and begin relating to other characters, either as a leader or as a full-blown member of the team. Characters can be first among equals, but they still must operate on the same plane as those they interact with on a regular basis in the story. Strong characters should make important choices. Making choices is what defines identity and character. The kinds of choices they make determine the character’s integrity and their honor. The choices do not necessarily have to be the right ones, but the character needs to make them, and they make choices only they can make. These choices propel the character arc and the story. Strong characters should take personal responsibility. Once these choices are made, the character has to accept the consequences, good or bad, of those choices. These consequences also serve as ways to propel the story, but a key test of a character’s integrity is how they handle the consequences. In most cases, the character has to restore balance, or re-establish some sense of fairness, in the world in which they operate. Strong characters should exhibit courage. Strong characters are self sacrificing in order to achieve something bigger than themselves. This is again one of the most powerful tools of a character. They can’t lay in hiding throughout the story. Without a doubt, a character can begin weak or cowardly, but they must evolve to a point where their self-sacrifice becomes a defining part of their story. Sometimes, the exhibition can be very small in the context of the story, but it has to be big in the context of the character. How do I rate Katniss Everdeen along these five characteristics? She never quite achieves a state of self-fulfillment or identity. In fact, she retreats from the world and refuses to engage in it once her tasks are completed. The Hunger Games is very much a plot and setting driven book so the story is very existentialist; the characters are driven to act because of circumstances beyond their control. Thus, the characters are reacting and relating to their environment; they are not manipulating their environment. Beyond this story-telling constraint, which appears to be intentional by author Suzanne Collins, Everdeen’s character is never in control. Even when it appears to the reader (and viewer) she is in control, she really is not. We never really get the sense that Katniss is her own woman–independent, strong willed, courageous, yes, but she’s not in control of her destiny. Not surprisingly, she plays defense, not offense. Even in a world in which defense is the only option, defensive strategies can be used offensively, but Katniss Everdeen is never that strategic. She leaves it to others to make these choices and take on the risks. In short, her choices do not drive the plot or the broader story. The exception might be in Mockingjay where she decides to go on her own to kill Snow, but even this is a weak form of decisionmaking and commitment. Her quest to kill Snow becomes driven by an existential drive for revenge and retribution, not a reflective choice about outcomes. Moreover, Katniss’s ultimate goal is to return to her home with her family. When she returns to District 12 without her family, she is essentially forced to cope with the loss, but doesn’t exhibit any of the courage associated with overcoming the scars and wounds of the violence she has experienced. She is depressed, and she has nightmares, but these define her new reality. She never engages in the healing that is necessary to seize control of her life, and she is not challenged after the rebellion finally takes control. We are left with some hope at the end, but we don’t have a real sense she has come to grips with the ugly realities she was forced to confront. We don’t get a sense that her character is stronger or more complete than when she stepped into the Hunger Games for the first time. Interestingly, my strongest characters are Nicole Klaas and Maria. Both of these novels won literary prizes. 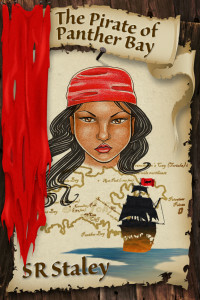 Renegade won second place in the children’s chapter book division of the Seven Hills Literary Competition. 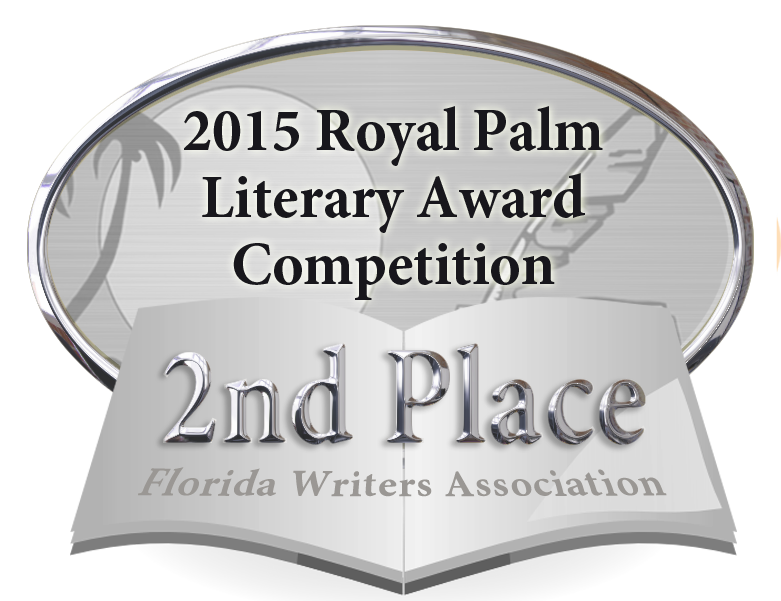 St. Nic, Inc. won second place in the Published Mainstream/Literary Category in the Royal Palm Literary Awards. I have taken my own advice to heart, however, and Isabella has evolved into quite a heroine as she takes her crew into the maelstrom of a nascent slave revolt in Port-au-Prince in Tortuga Bay (published in 2015). While I am disappointed that Katniss Everdeen doesn’t score higher along these criteria, The Hunger Games books remain very engaging reads. I recommend them for their quick pace, anti-violence, anti-war message even though Katniss Everdeen’s character arc is shallow. She is definitely brave and skilled, but she falls short of the leadership qualities and understanding of her own identity that would take her to the top of my list. Now for shameless self-promotion: get free shipping & handling if you buy any of my books from Southern Yellow Pine Publishing through December 30, 2015! Use the coupon code STNIC. This entry was posted in A Warrior's Soul, Books, Characters development, Heroes and villains, Pirate of Panther Bay, Renegade, SR Staley, St. Nic Inc, Teen & YA fiction, Tortuga Bay, writing and storytelling and tagged character arc, female characters, hunger games, hunger games movie, Isabella, katniss everdeen, mockingjay, pirate of panther bay, renegade, St Nic Inc, strong female characters, Tortuga Bay on November 22, 2015 by SR Staley. St. Nic, Inc., my re-imagination of the Santa Claus myth through the lens of an action-adventure novel. 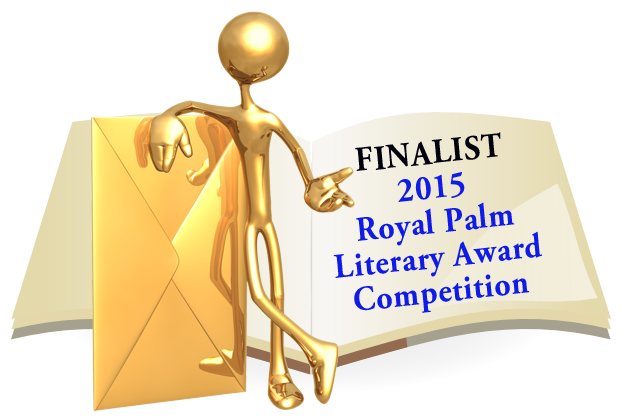 won 2nd place in the Published Mainstream/Literary Fiction category of the Royal Palm Literary Awards. This was a great win for a small book (for now) from a small, but rapidly growing press (Southern Yellow Pine Publishing). But what does this mean for my writing? The RPLA awards have several benefits for writers, including the fact they provide feedback from the judges and they allow submissions into multiple categories. 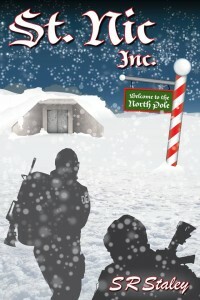 I submitted St. Nic, Inc. in two categories: thriller/suspense and mainstream/literary. St. Nic, Inc. didn’t make it to the semi-final round in the thriller/suspense category, but it nearly took home gold in mainstream/literary. So, this provides an interesting case study of how competition judges evaluate the same material. The judging in the RPLA competition is based on two rounds. The first involves two judges reading the first 50 pages of a manuscript or book. Judges evaluate the submissions using a rubric that generates a numerical score between 1 and 50. Books need to score at least 80 points (or about a 40 from each judge) to make it into the semi-final round. If the book (or manuscript) makes it to the semi-final round, another judge will read the entire manuscript and score it using the same rubric to determine whether it gets into the final round and in the running for an award. The final judge’s score (also from 1 to 50) is doubled, so the final round submissions are ranked based on a total potential score of 200 points. Reviewing the comments, neither judge felt the story moved fast enough, thought I devoted too much space to setting and not enough to plot and character development. One of the judges had trouble with the number of characters introduced in the first chapters (too many), and they wanted more “quirks” to make them interesting. On the final category, overall impression, they scored the story identically with a 6. I appreciated the candidness of the comments as well as their specificity, but I could hardly be encouraged by their evaluation of something I had spent years developing. You need a thick skin if you are going to submit your work to the judgments of others. Fortunately for my ego, one judge wrote that he or she would like to see more work from me. Both these judges in this genre thought the book was in the right category. So, my decision to enter my book in this category was at least validated by the judges with experience in the genre. Ironically, I’ve always felt that setting was the weakest part of my writing. I consider myself a character-driven author. These judges would clearly beg to differ with my self-assessment. But this is where the story gets more interesting. I also entered St. Nic, Inc. in the category of published mainstream and literary fiction. Honestly, I didn’t think it would perform well because I thought it was primarily an action/adventure story (and not really thriller/suspense either). I also thought this would be a more competitive category because many novels can fit under this umbrella. But my fortunes in RPLA this year turned because I accepted the risk of entering the novel into a second category. As the table shows, however, the third and fourth judges didn’t warmly embrace my novel either. They also didn’t respond well to my emphasis on setting in the opening pages. Fortunately, these judges gave me scores that allowed me to get into the semi-final round where the full manuscript would be read by a fifth judge. A review of the comments in the mainstream/literary category found that the first round judges also had issues with the plot and the lack of quirky characters. One judge noted it was difficult to determine which characters were the protagonists and which ones were the antagonists. They were also confused about the central setting of the story (which pivots between a hospital and DEA headquarters in Arlington, Virginia as two parallel story lines develop simultaneously). These judges also thought the book could be entered into the action/thriller genres, reinforcing at least my sense of where it would fit in terms of genre. The literary/mainstream judges wanted me to tighten up the action by streamlining the story, and one even suggested I consolidate a few chapters. Hardly a slam dunk into the final round, let alone scores to position me well for a top three placing. Still, I made it into the semi-final round. The fifth judge obviously made the difference. After reading the entire book—the only judge to read it in its entirety—St. Nic, Inc. received a 49 out 50. I have very little feedback because the judge liked almost everything in it. This judge also noted that the story could have moved faster, but she or he considered the story imaginative, creative, engaging, and pretty cool. Since this judge’s score was doubled in the final round, St. Nic, Inc., made it into the final round and received 2nd place. So, St. Nic, Inc. had a rocky ride in the RPLA judging. This was clearly not a cakewalk or an easy win. I also think it speaks well of the process, but that’s another story. I want to close with a few observations about what this means for me as an author, with several more books in the pipeline. What are my take aways? You can’t always judge a book by its first chapters. Stories are organic, but judging (no matter how well it maps over buyer behavior) that focuses on the first chapters (or pages) really doesn’t tell you much about the story if it has much complexity. The first chapters are just the hook. While important, they are not the story. Many of the elements of Nic, Inc. that the judges criticized were, in fact, artistic decisions about plot and character development. As long as writers recognize the trade-offs involved, and the potential downside of readers not buying the book or judges appreciating its complexity in the early chapters, writers should note the objections and consider them, but not necessarily use them as a writing guide. Even in light of the judges’ comments, I don’t think I would change the story much. Stay true to your vision as a writer. Nic, Inc. scores ranged from 35 to 49 on a 50 point scale. At the end of the day, literary competitions, even when they use a rigorous methodology for ranking books, depend on the subjectivity of the judge. Notably, all the judges recognized that the manuscript was technically well written—no mistakes in grammar, syntax, plot development or character development. Their criticisms centered on the creative and artistic aspects of the book, many of which included choices I made as a writer about plot and character. Not all my characters had quirks because in many cases—such as the way I treat little people—I wanted to demonstrate they were normal people in an extraordinary circumstance and setting. Giving little people quirks would have transformed them into munchkins, the exact opposite of how I wanted them perceived. Judges in literary competition pay a lot of attention to craft. They like a balance of character, plot, and setting, and they are interested in manuscripts that push, or at least give a strong nudge, to pushing against the edges of convention. Good books that are excellent reads may not do well in a literary competition because judges are looking for artistic qualities, and these qualities may not be what readers care about. Paradoxically, genre judges tend to look for stories that fit certain formulas—the one page hook, unambiguous plots, etc. This all makes sense because they are looking for the stand out contributions, so they want to see something different within the confines of their genre. The book’s hook—the events that start the story off—is critical. As a writer I should not expect a reader (or judge) to be patient. Most people don’t want to waste an hour reading a book or manuscript to see if they are going like it. As a matter of efficiency (and practicality), the hook is essential. And, in the RPLA competition (as well as other competitions) the hook determines whether you can even quality for the subsequent rounds. An excellent hook is a necessary but not sufficient condition for success. This is useful insight in general. The judges like tight, polished manuscripts. They don’t want to be distracted by formatting, grammatical, or spelling errors. This reflects a lack of professionalism, and they don’t want to bother reading a book when the author hasn’t done their due diligence in producing a book that respects their time and value as a judge. All judges noted that fact Nic, Inc. was free of technical errors and was well written. This was the third time I have entered RPLA with a manuscript. Notably, last year I submitted St. Nic, Inc. as an unpublished manuscript and it failed to advance to the semi-final round. While the 2nd place finish was gratifying, the ability to see the book do well in published form and receive excellent comments from the judges will help me frame my future submissions and keep me centered as an author. This entry was posted in Awards, Awards, Marketing, SR Staley, St. Nic Inc, writing and storytelling and tagged character development, judging, literary awards, plot, Royal Palm Literary Award, RPLA, setting, Southern Yellow Pine Publishing, SR Staley, St. Nic Inc, storytelling, SYPP on November 11, 2015 by SR Staley. One of the more gratifying aspects of winning 2nd place in the Royal Palm Literary Competition was that the it happened in October. This month is Dwarfism Awareness Month, and as readers of St. Nic, Inc. know, little people–dwarves–play an important role in the story and plot. I think my fictional characters mirror the roles real dwarves play more generally in our society, even though they are not always recognized or acknowledged. I am pleased that the RPLA award have given greater public visibility to this novel and, by extension, little people. Someone recently observed that all my novels address a social justice issue of some sort. In the Pirate of Panther Bay series, the stories focus on interpersonal violence and human dignity. 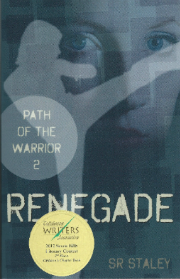 In Renegade and A Warrior’s Soul (the Path of the Warrior series), the issue is bullying and sexual assault. In St. Nic, Inc., prejudice and discrimination are critical elements of the plot and storyline. In fact, I can honestly say. without giving too much away, little people are an indispensable element to the story–the story just wouldn’t be the same, and not nearly as interesting, without them. Dwarves are full-fledged, multi-dimensional characters with their own ambitions, courage, fears, skills, and competencies, and their choices as individuals determine the outcome of the story. In no way are they tokens. Just who are some of these central characters? Several other characters play smaller but important cameo roles. Importantly, St. Nic, Inc. is not a story about little people. Rather, it’s a story about the North Pole, and what it might look like if it really exists. Little people make up about 25% of the North Pole population. Average-sized people play prominent roles as lead characters, but, like all societies, this is an ensemble story with different characters on different paths and arcs. Q&A with me on dwarves in St. Nic, Inc.
A matrix of discussion topics and classroom guide highlighting chapters and scenes relevant to tolerance, compassion & discrimination. So, thank you RPLA for helping me bring this discussion to a broader audience! For more information on Dwarfism Awareness month, click here. Support Little People of America by either joining (here) or buying St. Nic, Inc. through the LPA’s web site (under the section “Fiction with dwarf characters”). This entry was posted in Awards, Awards, Books, Inspiration, Interpersonal violence, SR Staley, St. Nic Inc and tagged A Warrior's Soul, bullying, discrmination, dwarf, dwarves, little people, little people of america, lpa, path of the warrior, pirate of panther bay, prejudice, renegade, sexual assault, SR Staley, St. Nic Inc on October 21, 2015 by SR Staley. St. Nic, Inc. was awarded second place in the 2015 Royal Palm Literary Awards, and the win was a real confidence booster for me personally. This isn’t the first time I’ve won a book award–Renegade (Wheatmark) took home second place in the Seven Hills Literary Contest and Drug Policy and the Decline of American Cities (Transaction Books) earned 1st place in the Sir Antony Fisher Memorial Prize–but the RPLA award has elevated my fiction writing to a new level of respect among my fellow authors. With a few more years of experience under my belt, however, I can reflect on the impact of the award and its meaning, personally and professionally. So I put together these thoughts on the expected and unexpected benefits of winning the award. Professional validation. Perhaps now more than at any other time, authors wonder if their writing is “good enough.” In part, this is due to the tremendous change in the publishing industry. As traditional legacy publishers with integrated national distribution networks consolidate, and smaller presses focus on niches, authors are finding the only practical pathway to publication is often through self-publishing or some form of subsidy publishing. While many excellent books are published through these sources–in fact, Renegade was published through Wheatmark, a very professional hybrid publisher–authors are often left wondering whether their writing is good enough to compete. Winning an award tells us that yes, we can write and we can achieve excellence, at least as measured by our peers. Reader validation. I didn’t really think about this until I pondered the self-centered nature of a one-star review I received on amazon for, ironically, St. Nic, Inc. The reviewer trashed St. Nic, Inc.–and I mean trashed it–despite a slew of four- and five-star reviews that proceeded it. When our books win a literary contest, we validate our readers and all those who enjoyed our stories and characters. No one who left a good review on amazon.com will ever have to justify their positive review, and, just perhaps, we hold the book snobs and narcissists accountable for their bad behavior. Raising awareness. Winning an award, or even making it to the semifinals or finals, raises awareness about our work, giving us a needed boost to our marketing efforts. Sometimes, publishers and authors get caught in a cycle of simply generating content and posts on social media just to keep our name visible. But winning a literary award provides real content and is a win-win: Authors benefit because the quality of our work is validated through an external, third-party source and the book awards benefit by marketing their contest, raising the competitiveness and improving the validity of the contest in future years. Rekindling the joy of writing. Writing is a long, arduous process. As creative as the it can be, we face many periods of slogging through stages we would prefer off load to someone else. I remember when my first book was published–Drug Policy and the Decline of American Cities–its actual publication seemed anti-climatic. So much time had been spent finalizing the manuscript, monitoring the book through the production process, developing the marketing plan, and navigating dozens of other smaller administrative decision points that that joy and wonder of writing seemed completely displaced. 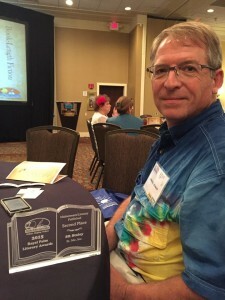 Winning the Fisher Award goosed my creative energies (as have the Seven Hills and RPLA wins). Validating my publisher(s). With nine published books under my belt, I think authors tend to forget the importance these wins have for our publishers. I have become more keenly aware of this since my venture with Wheatmark, a subsidy publisher (but not a true self-publishing company because they don’t take every project), I am more keenly aware of the time, effort, money and resources needed to bring a quality book to press. My publishers–subsidy, self, or traditional–deserve my best efforts to market and sell books for them. Otherwise, they go out of business and our careers stall. In years past, self-publishing was a dead-end for a career. Now, the game is completely different, and publisher like Wheatmark and my current (traditional) publisher, Southern Yellow Pine Publishing, are partners. Winning book awards validates their investment in me as an author. Many authors are rightly proud of our work when we win an award. But I think the benefits are far broader than we often appreciate. So, this award is not just for me; it’s important for everyone who supports and invests in my career as an author. This entry was posted in Awards, Awards, Marketing, Renegade, SR Staley, St. Nic Inc and tagged book awards, Inc, renegade, Royal Palm Literary Awards, RPLA, sam staley, Southern Yellow Pine Publishing, SR Staley, St. Nic, wheatmark on October 19, 2015 by SR Staley. 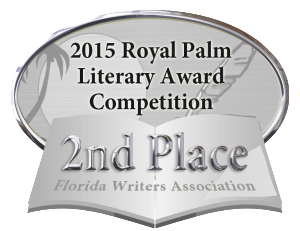 St. Nic, Inc., my reality-based re-imagination of the Santa Claus myth, won 2nd place in the 2015 Royal Palm Literary Awards held in Orlando during the annual conference of the Florida Writers Association on October 17, 2015! St. Nic, Inc. earned its award in the competitive Published Mainstream/Literary Fiction category. First place went to The Clock Strikes Midnight by Joan C. Curtis, and third place went to Passing Through Perfect by Bette Lee Crosby. The FWA uses a rigorous, anonymous review process to select their winners. Each entry is given a numerical score based on a rubric designed by the committee supervising the RPLA. This provides analytical consistency in what is inevitably a subjective evaluation of the quality of writing. (I have personally used similar rubrics for more than 20 years to discipline my own grading of papers assigned in my classes at the college level.) In order to progress to each successive stage–semi-finalist, finalist, and winner–written works have to achieve minimum scores using the rubric. Thus, in theory, no award can be given in a category because none of the submitted works earn sufficiently high scores. In fact, this has happened. This year was the first time an award was given in every category, although several categories awarded just first or second places (e.g., published romance, unpublished romance, published science fiction). This year, 378 manuscripts were entered into the RPLAs in 30 different categories and evaluated by 125 anonymous judges. Categories include a wide range of subjects and genres, including published and unpublished books; adult, young adult, and middle-grade fiction; poetry and flash fiction; thriller/suspense and women’s fiction, and several nonfiction categories and others. About 25% of the authors submitting manuscripts made it into the final round this year, and 18% (68% of finalists) won an award–either first, second, or third place in their category. (Six entrants by my count won awards in multiple categories). A full list can be found here. I also want to give a shout to my fellow Tallahassee Writers Association author Darryl Bollinger, author of the medical thriller The Care Card, for winning second place in the Published Thriller/Suspense category! Read the reviews of St. Nic, Inc. here. Buy the book at amazon here! This entry was posted in Awards, Awards, Marketing, SR Staley, St. Nic Inc and tagged Darryl Bollinger, florida writers association, FWA, Inc, literary awards, literary competition, Royal Palm Literary Awards, RPLA, SR Staley, St. Nic on October 18, 2015 by SR Staley. Pirates, Aliens, and Cats, Oh My! I will be signing copies of the Pirate of Panther Bay, St. Nic, Inc, A Warrior’s Soul, and Renegade at My Favorite Books in Tallahassee on Saturday, July 18, 2015, from 11 am to 1 pm. 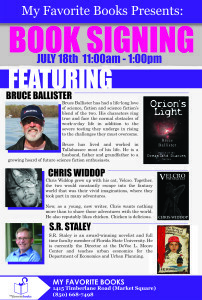 If you are in town, come out and join me as I talk about these books and others, including the forthcoming Tortuga Bay. We will be joined by Chris Widdop, author of Velcro: The Ninja Kat and Velcro: The Green Lion. Check out Chris’s blog for insights into popular culture and media, including timely movie reviews. Need I say more? I’ve not met Chris before, but he lists Edge of Tomorrow, Guardians of the Galaxy, and Interstellar among his top five movies for 2014. I think we’ll get along well. Don’t forget to visit my updated website for the newest news! This entry was posted in A Warrior's Soul, Book Signings, Marketing, Pirate of Panther Bay, Renegade, SR Staley, St. Nic Inc, Teen & YA fiction, Tortuga Bay and tagged A Warrior's Soul, action, adventure, book events, book signings, cats, Chris Widdop, marketing, My Favorite Books, ninja, pirate of panther bay, renegade, science fiction, St Nic Inc, Tortuga Bay on July 11, 2015 by SR Staley. “St. 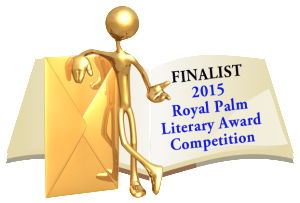 Nic, Inc.” is Royal Palm finalist! I’m pleased to announce that St. Nic., Inc., my contemporary re-imagination of the Santa Claus myth, is now a finalist in the Royal Palm Literary Award Competition hosted by the Florida Writers Association. St. Nic, Inc. is competing in the mainstream fiction genre. According to reviewers, St. Nic., Inc. “sparkles like the North Pole on a sunny day” (Donna Meredith) and “a fast paced thriller that explores government overreach, technology’s role in society, and what it means to ‘do good'” (Jim Booth). Final awards will be announced October 15-18, 2015 at the FWA’s annual conference in Orlando. St. Nic, Inc. can be purchased at amazon.com or Southern Yellow Pine Publishing. This entry was posted in Awards, SR Staley, St. Nic Inc and tagged florida writers association, Royal Palm Literary Award, Santa Claus, St Nic Inc on July 6, 2015 by SR Staley.